The anaphora poetic form is, in some respects, fairly simple. It’s not confined to syllables or pentameter – any style of prose or poem will do, as long as one uses the repetition of a word or phase. It worked for Winston Churchill and Martin Luther King, Jr. It’s part of the swinging cadence of sermons and political speeches (which we’re all paying avid attention to this month so we can VOTE, right? Right). So, on the surface, this was one of the easier challenges I could come up with for a very, very busy month. Do you ever get the feeling that October is like kicking a ball downhill that only picks up speed in November? Most of us have snatched a moment here or there for poetry this month, but it’s not been a time to stop and smell the roses for many of us. Thus, today’s poem is… meant to recapture the last time we really could slow and observe things as we wanted to — childhood. 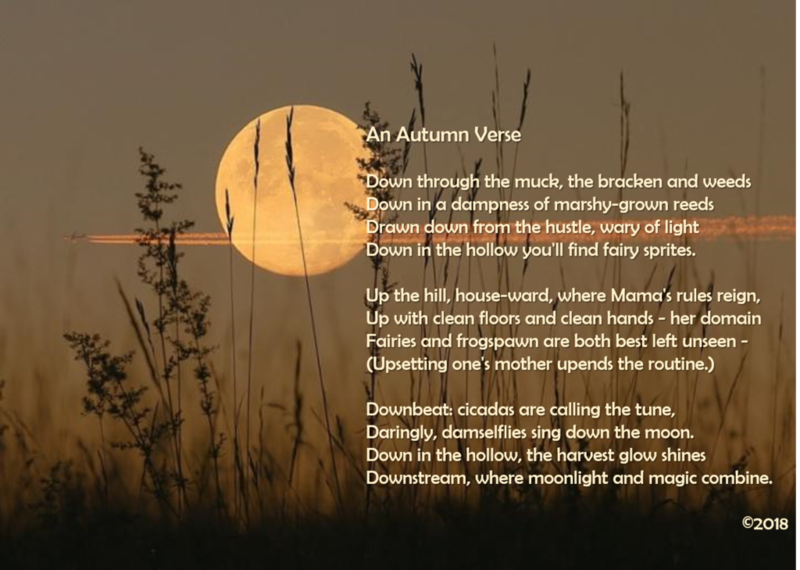 I thought of Robert Louis Stevenson’s 1929 “A Child’s Garden of Verses,” and this became a child’s autumn verse – celebrating the moon and the muck and the bugs in a new season, and all the adventures to be had evading bedtime, at the end of the day. If I’d thought about it, I could have finished the poem with the morning and giving up the loss of night time, but, oh well. I’m taking a page out of Laura’s book today, and combining the poem with an illustration. I’m grateful this poem came to me, because everything else I came up with was really heavy and dark, and — no. Enough with that right now. This is a month of gratitude, and so I’m thankful for the opportunity to stop and hunker down in the weeds to see what treasures might be discovered. Other discoveries this month are at Laura’s blog. Tricia’s poem – which she is probably still tweaking – is here. Liz is ,a href=”http://lizgartonscanlon.com/2018/11/poetry-project-november-2018/”>burying her lede. Andi joins us again this month, Kelly’s poem she composed on the fly while Sara’s traveling and will post later this month. Happy month of gratitude. I’m thankful that Poetry Friday today is hosted over at the amazing and vote-centric Alphabet Soup by Jama-j, who is all things awesome. I would go head off into a contemplative life with the six of you any day! And Tanita… I know I’ve said this before, but I always love the way you talk ABOUT your poetry, the musings and heartfelt philosophizing behind every perfect, poetic line. It makes me feel so close to the poems and so close to you… This is all just beautiful…. 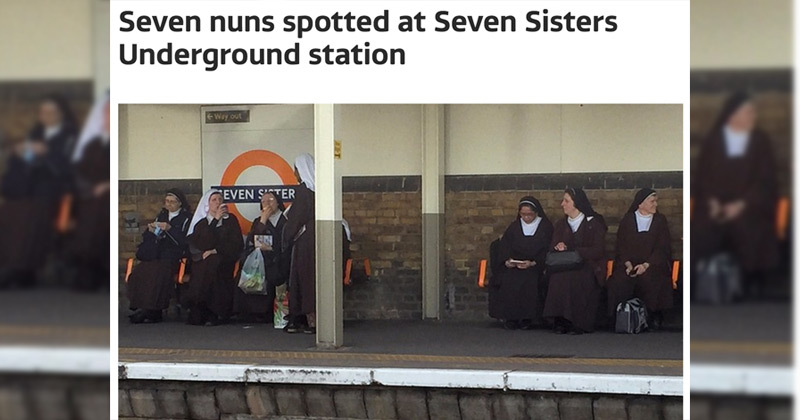 Now I’m thinking of a poem entitled If We Were Nuns. Ah, the potential! But you’ve made something holy from the “muck and bracken and weeds” and I find such joy in your images, and sounds, and especially in “daringly, damselflies call down the moon.” I could feel that mini fairy spell trip off my tongue many times. T., this is so beautiful. I want to follow you down into that hollow and listen to the cicadas while watching the moon rise. Lovely photo and such delightful lines. Thanks for reminding me of those childhood days-ends. @jama-j: Thank you! I’m so glad the “kid”-eye-view came through. And PS, I apparently totally ignored an assigned theme for our poem. Oops. It was not on purpose, but I felt lucky to get a poem, period, as I am definitely in that frazzled, ball rolling downhill mode you mentioned!